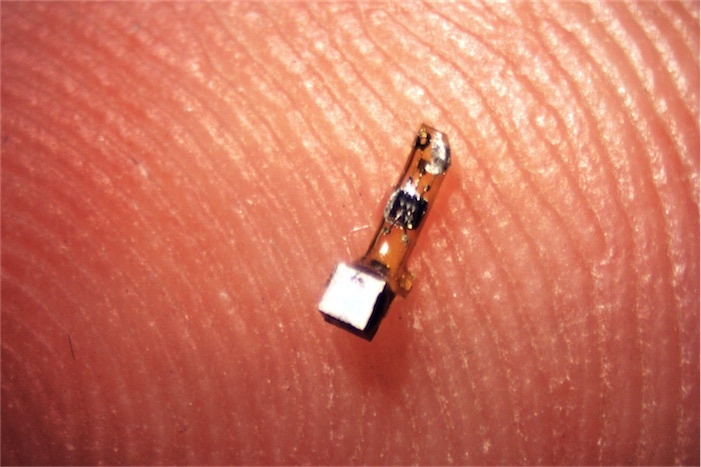 UC Berkeley researchers are developing "Neural Dust," tiny wireless sensors for implanting in the brain, muscles, and intestines that could someday be used to control prosthetics or a "electroceuticals" to treat epilepsy or fire up the immune system. So far, they've tested a 3 millimeter long version of the device in rats. “I think the long-term prospects for neural dust are not only within nerves and the brain, but much broader,“ says researcher Michel Maharbiz. “Having access to in-body telemetry has never been possible because there has been no way to put something supertiny superdeep. But now I can take a speck of nothing and park it next to a nerve or organ, your GI tract or a muscle, and read out the data." Maharbiz, neuroengineer Jose Carmena, and their colleagues published their latest results on "Wireless Recording in the Peripheral Nervous System with Ultrasonic Neural Dust" in the journal Neuron. “The original goal of the neural dust project was to imagine the next generation of brain-machine interfaces, and to make it a viable clinical technology,” said neuroscience graduate student Ryan Neely.